Profit from ranging and trending conditions! 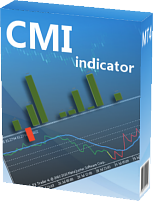 The CMI indicator enables an easy way to build a daily strategy that can profit from both ranging and trending conditions by incorporating 2 entry rules. The first will tackle the range, while the second will handle the trending market. Both entries will have exit positions when the CMI crosses the 50 percent level, which suggests uncertainty about whether the market is ranging or trending. 1. Enter long when the smoothing MA (blue line) of the CMI is below 40 and the CMI line color is red. 2. Enter short when the smoothing MA (blue line) of the CMI is below 40 and the CMI line color is green. 3. Exit trades trades when CMI moves above 50. 1. Enter long when the smoothing MA (blue line) is above 60 and the CMI line color is green. 2. Enter short when the smoothing MA (blue line) is above 60 and the CMI line color is red. 3. Exit trades when CMI moves below 50. The example iCustom() calls presented above use default indicator settings 60, 10 (period / MA period). The author of this page and its contents is not responsible for any loses, misunderstandings, omissions or missing information of any kind. All investors are advised to build their understanding of the Forex market from various sources before making any investment decisions. This is neither a solicitation nor an offer to Buy/Sell currencies, futures, stocks or options on the same. No representation is being made that any account will or is likely to achieve profits or losses similar to those written on www.the-forex-strategy.com and/or www.az-invest.eu.